This year's F1 coverage split between pay and free-to-air broadcasts has been announced. It's the last year of regular free-to-air coverage in the UK. Channel 4's deal to cover F1, which was poached from the BBC following one of its cost-cutting exercises, expires at the end of the year. From 2019, Sky has the exclusive UK rights to broadcast F1. As part of its live coverage of all 21 race weekends from across the globe, Sky Sports F1 will show exclusive coverage of the first grand prix of the season. Two new grands prix for 2018 will also be shown exclusively live on the pay TV service. 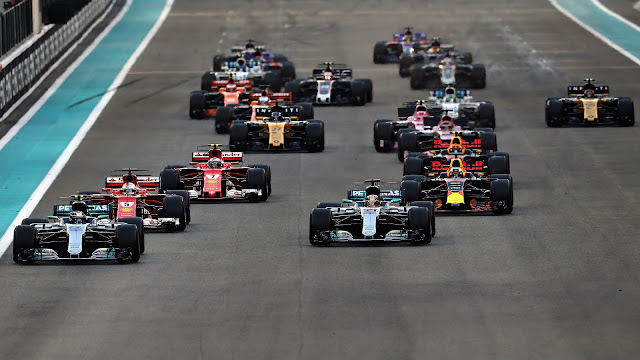 Returning to the F1 calendar for the first time in nearly thirty years, Circuit Paul Ricard in Le Castellet will host the French Grand Prix in June, while the German Grand Prix from Hockenheim makes its comeback after a one-year absence. Free-to-air coverage via Channel 4 starts with the Bahrain Grand Prix on the weekend of 6-8th April. Sky subscribers are able to purchase the Sky Sports F1 channel for just £18 a month, different terms apply on other platforms. As for 2019, Sky said when it won the exclusive rights to F1 that it would only show the British Grand Prix on a free-to-air basis. Sky has acquired exclusive rights to F1 in both the UK and Italy. Sky attempted to acquire exclusive rights in Germany, but failed, and last week announced it was no longer going to show F1 after this year.